Years ago, when I first started working as a planner for the City of Chicago, my primary responsibility was working with community organizations that received Community Development Block Grant (CDBG) funding for commercial revitalization activities. This being CDBG funding, our work was constrained to areas of the city where 51% or more of households earned less than the median household income for the Chicago metro area. 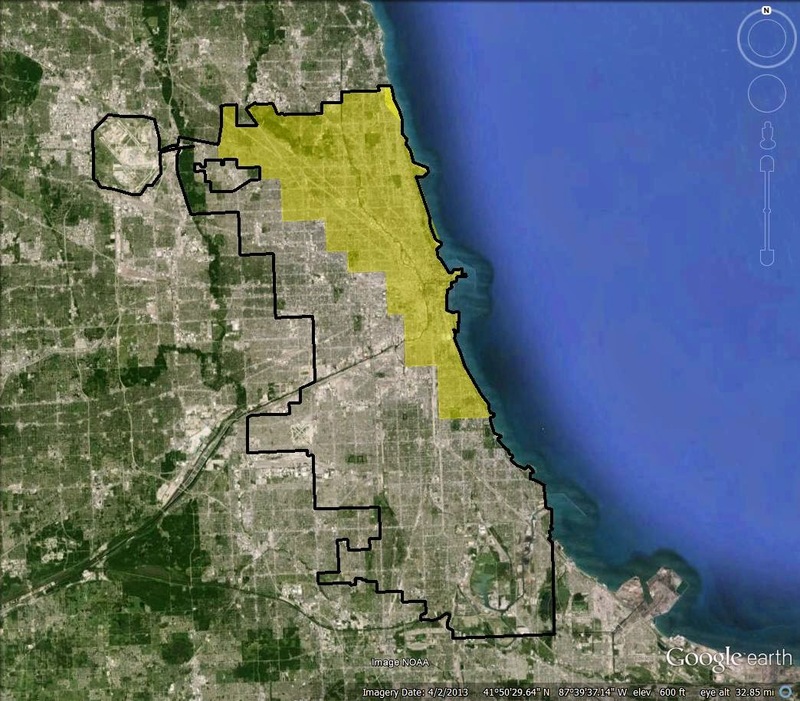 In the early 1990’s, this hardly interfered with our work — outside of the Gold Coast, the Near North Side, Lincoln Park, Lakeview and a few parts of the Northwest and Southwest sides, we were able to grant CDBG funding to virtually the entire city. Fast forward twenty years. Chicago’s transition from Rust Belt Capital to Global City has been unparalleled. Where there once had been large swaths of middle-class, working-class and impoverished neighborhoods, with high-income enclaves, there are now nearly as many high-income neighborhoods as there are of the other three. Perhaps someone who moved to Chicago post-1995 and lives in one of the up-and-coming areas is vaguely aware of this, but anyone who was here before then is quite right to be astounded. Over the last twenty years, at the same time as overall crime has declined, the inequality of violence in Chicago has skyrocketed. There have always been safer and more dangerous areas here, as there are everywhere; but the gap between them is way, way bigger now than it used to be. I was on the train earlier this week, and two white men got on and asked their neighbors, who were two black women, how to get to a hotel. The women told them. And then began a sort of stock conversation that Chicagoans have with tourists: How do you like the weather, ha ha? The men, who were from Atlanta, did not like it. Have you been on a subway before? Yes, but not often. Would you come back? Oh, yes. We love Chicago, the men said. The men reached their station, and left. One woman said to the other: I hate it when people say that — I love Chicago. No, you don’t. You love downtown and the North Side. The other woman said, Uh huh. That is a frequent sentiment of those who live on the other side of the invisible divide in Chicago. But what, exactly, is that divide? Where are the boundaries? Exactly how deep are the difference? I took a stab at trying to figure this out. I compared some socio-economic statistics for the 56 zip codes in Chicago against medians and averages for the entire Chicago metro area (Indiana and Wisconsin excluded). The differences are stark. 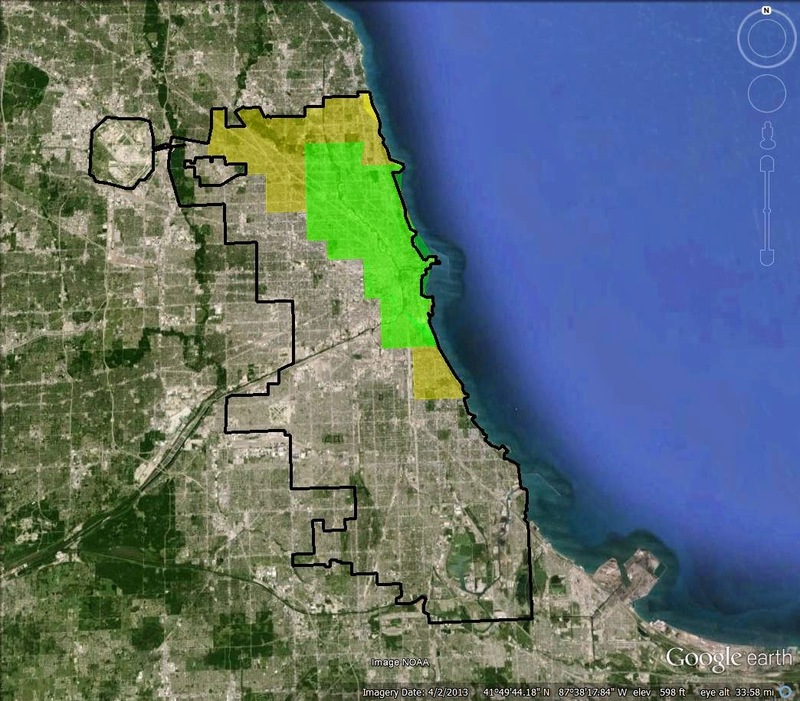 I gathered data for all suburban municipalities and all City of Chicago zip codes within this area, for five variables — population, non-white population percentage, median household income, and median home value, and bachelor’s degree or more for persons 25+. The data comes from the 2011 U.S. Census American Community Survey. After collecting that data, I established an “average of medians” or “average of averages” to get a baseline for the metro area, and an understanding of how jurisdictions or zip codes would compare to one another. One fairly big caveat — an average of medians or average of averages weighs all jurisdictions equally, skewing the numbers higher due to the number of small but well-to-do suburban municipalities. So while the 2011 actual median household income for the seven-county area overall was $61,491, the average of medians was $74,731. But since all data is expressed this way, differences are negated. Most Chicagoans would recognize this as the wealthier parts of the city. 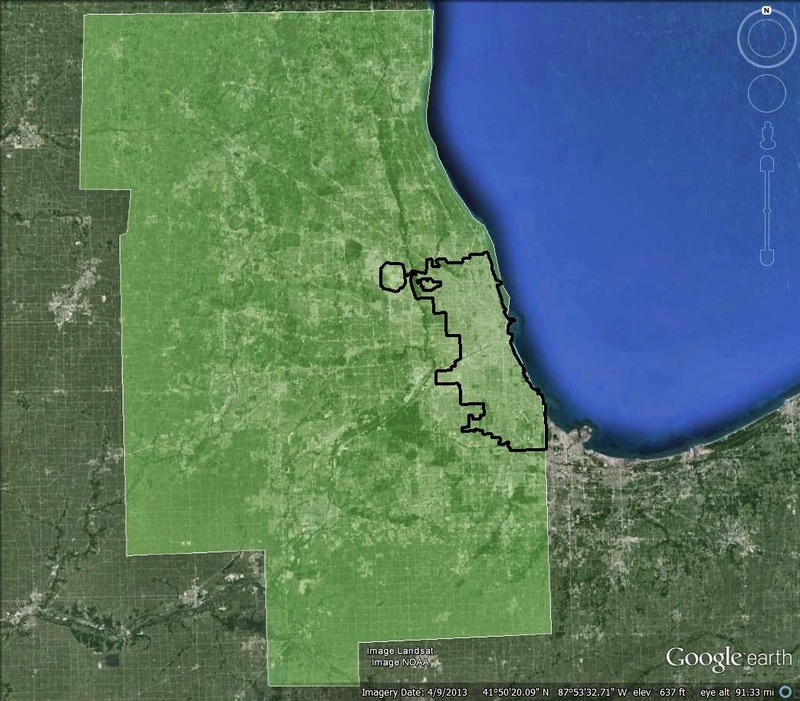 It stretches from the far Northwest Side eastward to the lake, south to downtown and continuing south before ending in the Hyde Park neighborhood on the South Side. Again, I included all zip codes that were above the metro average for at least one of the three categories I examined, so not all communities are the same. Hyde Park, for example, is here because it has high educational attainment, but is below the average for income and home value. The same applies to Rogers Park and Edgewater on the city’s northern border with Evanston. Jefferson Park, Norwood Park and Sauganash, on the other hand, located on the Northwest Side, rank highly in home value but lower for income and educational attainment. The differences are indeed stark. “Global Chicago” is on par with the Chicago suburbs and the metro area overall in terms of income, and has a lower percentage of minority residents compared to the metro area. Interestingly, “Global Chicago” has a much higher home value and educational attainment when compared to the metro area overall or the ‘burbs. Meanwhile, “Rust Belt Chicago” lags far behind. “Rust Belt Chicago” has a large majority-minority population, has an income nearly one-half as much as the suburban households, and has only one-third as many college graduates as “Global Chicago”. Here, a “Super Global Chicago” compares favorably with the ‘burbs in terms of income, but far exceeds it in terms of home value and educational attainment. Including some of the peripheral areas of the previous “Global Chicago” with the previous “Rust Belt Chicago” to produce an “Average Chicago” leads to some gains, but it still lags far behind the other slices of the metro area. Right now, the CNN series “Chicagoland” is doing its best to illustrate the “Two Chicagos” meme, highlighting blues festivals and Stanley Cup championship celebrations on one end of town and school closures and endless crime on another. However, these maps and tables may do a far better job of demonstrating the impact of past and current practices and policies on the city’s landscape. In fact, I think Chicago’s example is one that will serve as a model, for better or worse, for other cities across the nation. In reality I see the “Two Chicagos” meme as overplayed. Chicago may be better understood in thirds — one-third San Francisco, two-thirds Detroit. This post originally appeared at Corner Side Yard on March 18, 2014.